Five more days until Christmas! And it's time for my annual Nutcracker post This year, both Big Sis and Little Sis danced in the Ballet Wichita production of The Nutcracker. Big Sis was a Ginger Cookie, popping out from under Mother Ginger's skirt. (The man who plays Mother Ginger is actually an old family friend, which made it especially sweet.) Little Sis made her debut at the top of Act II as a Baby Angel. The ballet is double cast, to allow as many dancers as possible to have their turn. Baby Angels only perform in the main weekend production, but the rest of the cast went on tour to McPherson last weekend. There is also an hour long version performed for school field trip groups. Big Sis danced once in McPherson, and twice for the field trips. I sat through all four performances, plus brought the girls to the final matinee to see their friends, and yes, I have been humming Tchaikovsky to myself all week! Did I mention we got snow the day of their big performance? It was blustery, blinding snow, and the temperatures hovered around three degrees all weekend! 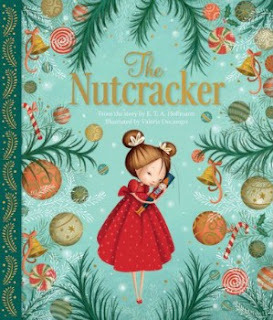 We checked out several good Nutcracker books this year, and I'll post the information for those below, but I decided to focus on this beautiful rendition, a Christmas gift to the girls last year from my dad. The Nutcracker by An Leysen. 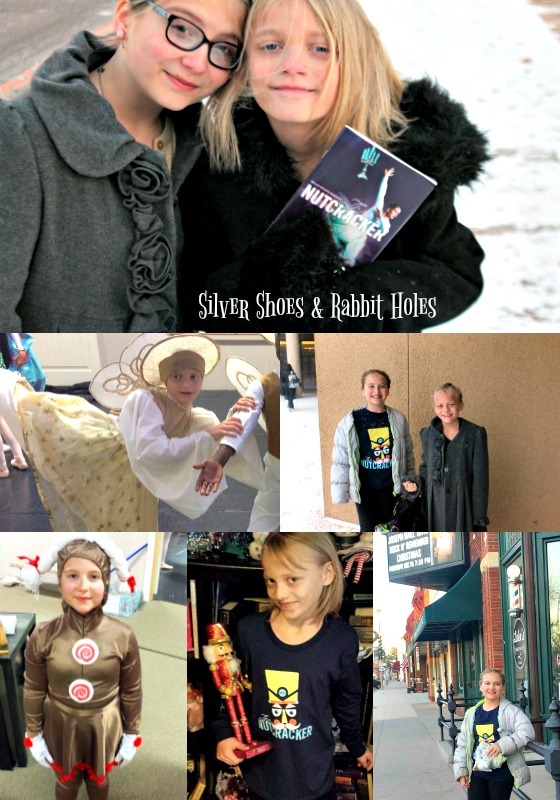 Clavis Books, 2015. If you were a reader of my blog last January, you may remember a gorgeous book called Pinocchio's Dream. This one is by the same illustrator, a Belgian artist named An Leysen. I adore her work, and these books, published by Belgian house Clavis Books, are handsomely done. 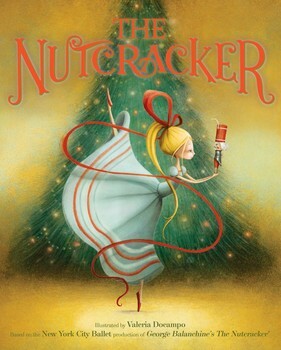 In this adaptation, the little girl is named Clara, like she is in so many ballet versions of the story. (She was Marie in the original E.T.A. Hoffmann story.) However, this version incorporates some of the plot from the original Hoffmann that is usually left out of the ballet, namely the story of Princess Pirlipat (spelled "Pierlepat" here) and the curse of the Nutcracker. It's simplified a bit, with Pierlepat spurning the soldier who saves her, thus transferring the curse to him. As I said, we also checked out multiple books from the library and used bookstore this year. They each have something to recommend them. 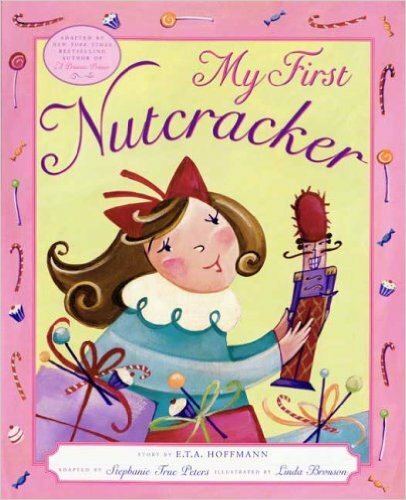 I found My First Nutcracker, written by Stephanie True Peters and illustrated by Linda Bronson, at a used bookstore. I bought it for my nieces, as they were going to see the ballet for the first time this year. It has bright, sweet, swirly illustrations and served as a perfect introduction to the story the girls saw on the stage. It is out of print, but the store had multiple copies, so it shouldn't be too hard to find. illustrated by Linda Bronson. Dutton, 2007. A new book this year is Valeria Docampo's beautiful collaboration with the New York City Ballet, illustrating George Balanchine's celebrated version of the ballet. It's been featured on multiple book and parenting blogs lately. illustrated by Valeria Docampo. Little Simon, 2016. The same week we checked that one out from the library, we found this one in the children's bargain section at Barnes & Noble! It is also illustrated by Valeria Docampo, but it is a different book, based off the Hoffmann tale. illustrated by Valeria Docampo. Parragon, 2016. 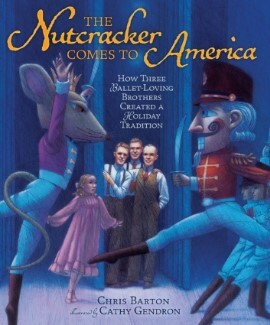 The Nutcracker Comes to America: How Three Ballet-LovingBrothers Created a Holiday Tradition by Chris Barton, illustrated by Cathy Gendron. Millbrook Press, 2015. For more Nutcracker goodness, check out my Pinterest board. All of my past Nut-related posts can be found here. Anyone else see a production this year?